The brain cells have been burning lately with my latest obsession: putting together a home-brew campaign setting for Swords & Wizardry, tentatively titled Dark World. 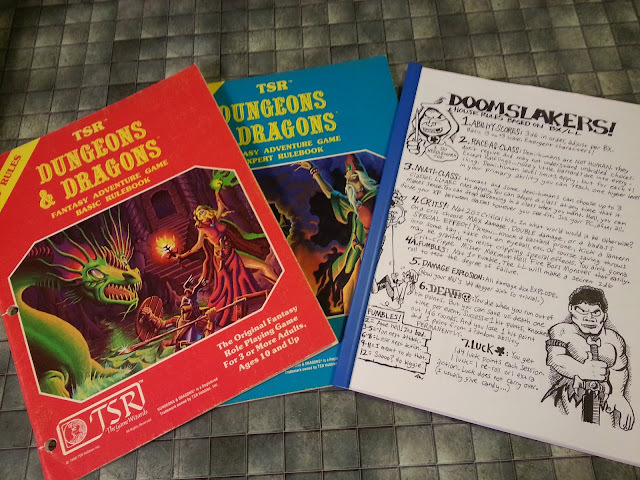 I've been mentally compiling the various bits and pieces that I want to include in my "sandbox" world, with inspiration coming from a wide range of sources (including - but not limited to - Howard, Lovecraft, Smith, Moorcock, Thundarr the Barbarian, The Pirates of Darkwater, etc.). I've dropped these into the cauldron that is my imagination, and am letting them stew there to see what bubbles up. Watch this space for more details. Great sheet! I could see myself using this for S&W or D&D even though I'd be using my own homebrew setting. Once upon a time I had grand plans for a S&W/SciFi mash-up sort of like John Carter of Mars meets Gamma World. But there are some really awesome looking projects already well under way in a somewhat similar vein, and I think I'll just enjoy the fruits of someone else's labor for a change. Thanks, all, for the interest and votes of confidence! @Al: Oh, yes - count the Herculoids amongst the "etc." sources of inspiration. 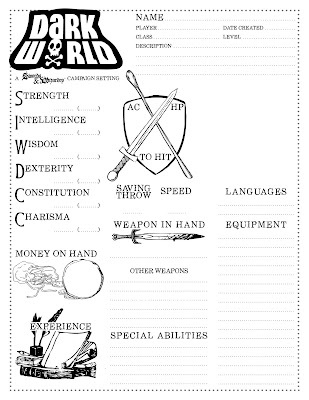 @Superhero Necromancer: I may just strip out the Dark World logo to make a non-setting-specific S&W sheet in this style. If there's any interest, that is. I very much like crossed weapons into AC/HP/TH trifecta! But IMHO the money and experience graphics are crowded/busy and subtract from the overall awesomeness. The rest of the sheet is totally Boss! And is the background of your blog new? or have I just never widened my browser enough to see it? Either way it's big A Awesome. @Norman: New to the very best of my knowledge. And, yes, the background is new. Glad you like!